Eyeliner, seems like a simple concept. You line your eyes, move on. But, what you use to line your eyes will make a HUGE difference in your final look. The main/major options would be pencil, gel or powder. Each one has a very different look and applies very differently. So what to use? Lets break each down a bit. Pencil. This is the most basic, the go to for every day look. Until I started really playing with makeup it was my go to product. Seemed easy enough, you use a pencil in every day life, and you have been writing since you were about 5. It has to be the easiest. Right? Actually, in my experience, it is the hardest of the three to use on your upper eye line. It can tug and pull, resulting in a skipped look. You can pull the side of your eye, making the skin more tight to help avoid this. But really, who wants to be tugging at the delicate skin around your eyes. However, to line my water line (the little shelf area just outside of your eye), I only use a pencil. It handles the best, for me. So what does that leave, if you are to stop using a pencil? You have gel. This is applied with a flat angled brush. You dip it in the gel and run the brush along the lash line. This leaves a more dramatic, bold line. Perfect for many looks. It is the go to for a night out without the kids. I know this is intimidating, I was scared for years to try this. This is probably the easiest option once you get the hang of it, though. The trick, with any liner, is to get it right against the lash line. 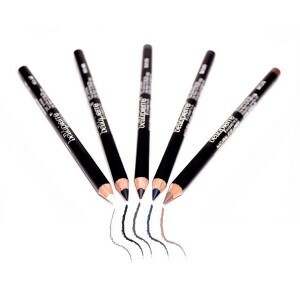 Unlike a pencil, since it is applied with a soft (compared to a pencil) brush, there is not tugging or pulling. It glides easily across the eyelid. You can line your eye first and then apply your eye makeup. This will soften the look a bit. Or you can use it after every else is applied giving it a much bolder look, especially in a black. What about those days that you are wanting a really soft look, or are on mommy duty where a bold line would be to much? Powder. Powder is probably my favorite to use. It is almost as easy as the gel. There is no liquid, so it doesn’t slide quite as easily as the gel. It is still applied with a flat angled brush, so there is no pulling or tugging. It gives a softer look, while still adding definition. This method is very forgiving, you can have a very thin line or a big thick line, the look will still be much softer then gel. And the color options are just about unlimited, you can match it perfectly to your eye shadow colors. I like using a matte, light, neutral colors on my eyes with a pop of green or purple for the liner. Gives some color without being over the top. For added wow-ness, I might only line my lower lash line with the pop of color. It gives you the option to really play around, without having a huge change to your look. Eyeliner is one of the most versatile ways to subtly change your look without having to buy a bunch of new makeup. Small changes can dramatically change your look. Um, love this!!! I have long said that if I were stranded on a desert island, the one makeup product I would want to have with me is eyeliner. It kicks your look up about 1,000 notches. I use a charcoal pencil for mommy duty. Too scared to try gel, but maybe I should. How do you do the winged look… Is that gel? It has always been my one item too. How funny, it really does do a lot for your look. Don’t be intimidated by the gel, it is way easier then it seems. Yes, you certainly do the winged look with a gel, but you can also do it with powder. It just won’t be as dramatic. Maybe powder would be a good place to start. Just get a good brush and you are set. Thanks for stopping by.